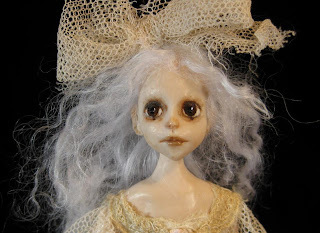 Ceci, Ghost Child of the Attic is on her way tomorrow to a new home. She finally is escaping the bonds of the attic of Castle Keep and setting off on a new haunt! 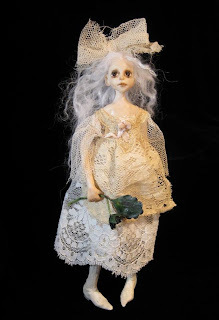 I will miss her (she is my first Ghost Child, and I LOVED creating her), but I'm thrilled that she has found such a wonderful new home. Time for the next one!! this Ceci si full of poetry...I love colors and shapes, brava! I love Ceci. glad she found a home! this is a wonderful piece, sue! I'm so happy to have found your blog. I love the connection that blogs offer. "I love the connection that blogs offer." starting a blog for so long! Ceci is a jewel.. I can't wait to see what you make with the armatures you have ready! She´s adorable !!! I hope you won´t miss her too much !! !